1. Spread each tortilla with 2 tablespoons of mayonnaise. In a medium bowl, combine remaining ingredients and toss together. Divide salad evenly among the tortillas. To serve, roll up burrito style and slice in half. 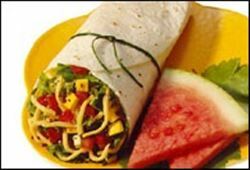 Enjoy this delicious salad in a flour tortilla Mexican recipe!